The Haines Index is used to indicate the potential for wildfire growth by measuring the stability and dryness of the air over a fire. It is calculated by combining the stability and moisture content of the lower atmosphere into a number that correlates well with large fire growth. The stability term is determined by the temperature difference between two atmospheric layers; the moisture term is determined by the temperature and dew point difference. This index has been shown to be correlated with large fire growth on initiating and existing fires where surface winds do not dominate fire behavior. 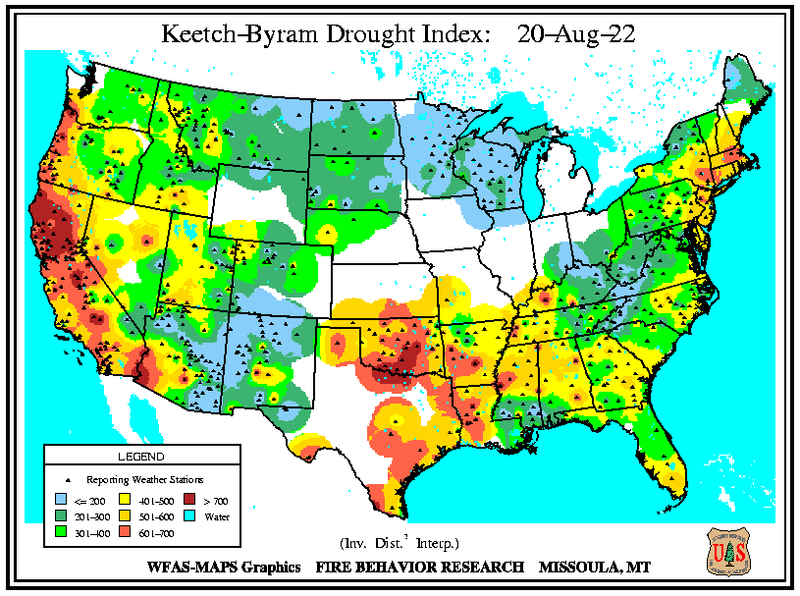 The Keetch and Byram is a designed drought index specifically for fire potential assessment. It is a number representing the net effect of evapotranspiration and precipitation in producing cumulative moisture deficiency in deep duff and upper soil layers. It is a continuous index, relating to the flammability of organic material in the ground. The KBDI attempts to measure the amount of precipitation necessary to return the soil to full field capacity. It is a closed system ranging from 0 to 800 units and represents a moisture regime from 0 to 8 inches of water through the soil layer. At 8 inches of water, the KBDI assumes saturation. Zero is the point of no moisture deficiency and 800 is the maximum drought that is possible. At any point along the scale, the index number indicates the amount of net rainfall that is required to reduce the index to zero, or saturation. The inputs for KBDI are weather station latitude, mean annual precipitation, maximum dry bulb temperature, and the last 24 hours of rainfall. Reduction in drought occurs only when rainfall exceeds 0.20 inch (called net rainfall). The computational steps involve reducing the drought index by the net rain amount and increasing the drought index by a drought factor. KBDI = 0 - 200: Soil moisture and large class fuel moistures are high and do not contribute much to fire intensity. Typical of spring dormant season following winter precipitation. KBDI = 200 - 400: Typical of late spring, early growing season. Lower litter and duff layers are drying and beginning to contribute to fire intensity. KBDI = 400 - 600: Typical of late summer, early fall. Lower litter and duff layers actively contribute to fire intensity and will burn actively. KBDI = 600 - 800: Often associated with more severe drought with increased wildfire occurrence. Intense, deep burning fires with significant downwind spotting can be expected. Live fuels can also be expected to burn actively at these levels. 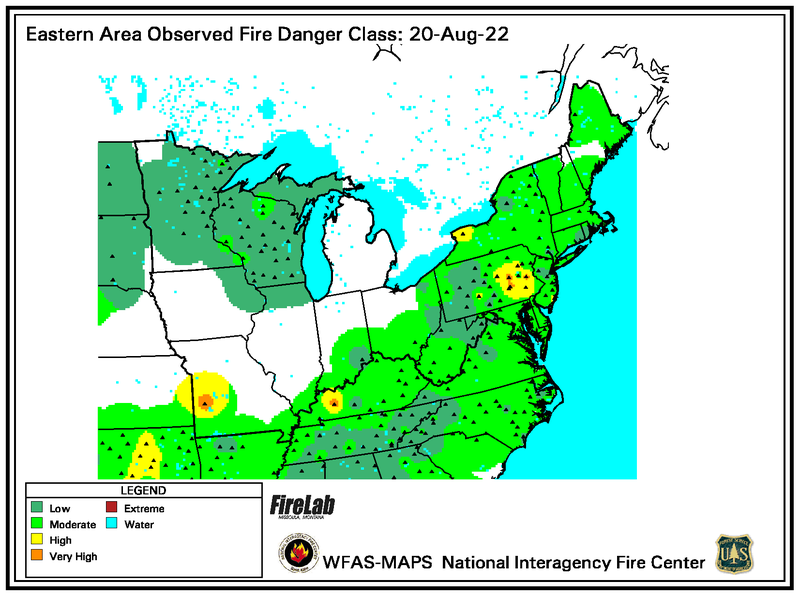 A Fire Danger Rating level takes into account current and antecedent weather, fuel types, and both live and dead fuel moisture. An adjective class ratingis a method of normalizing rating classes across different fuel models, indexes, and station locations. 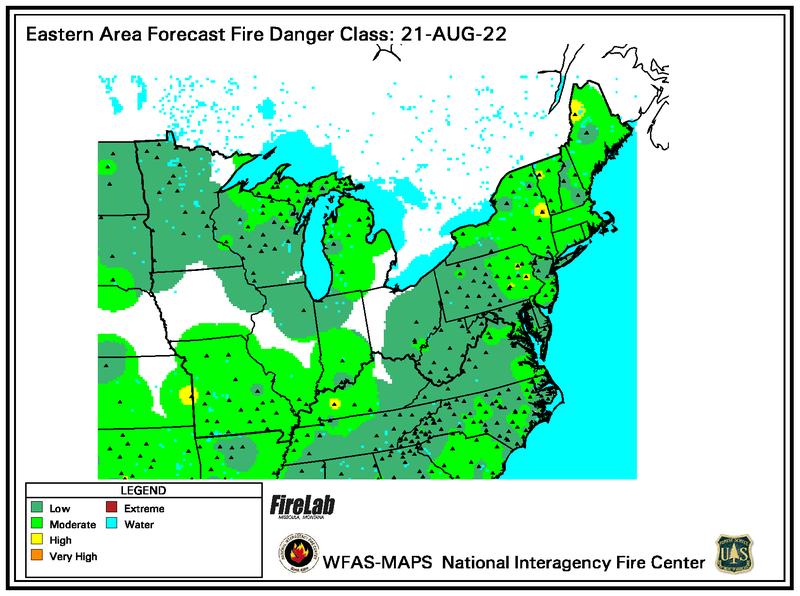 It is based on the primary fuel model cataloged for the station, the fire danger index selected to reflect staffing levels, and climatological class breakpoints. This information is provided by local station managers. About 90% use the Burning Index (BI); others use Energy Release Component (ERC). 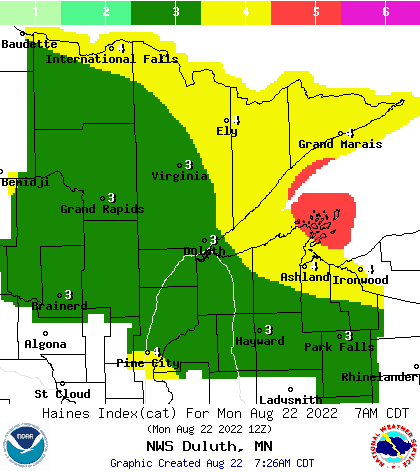 Staffing class breakpoints are set by local managers from historical fire weather climatology. Only reporting station locations are indicated with a marker on the maps. Values between stations are estimated with an inverse distance-squared technique on a 10-km grid. This works pretty well in areas of relatively high station density, but has obvious shortcomings in other areas.